Dr. Charles Wukasch (Wendish: Korla Wukaš) holds B.A. (Russian), M.A. (Slavic linguistics), and Ph.D. (Slavic linguistics) degrees from the University of Texas at Austin. He spent the spring semester of 1965 at the University of Leipzig, the only university in the world with a program in Wendish (Sorbian is the preferred scholarly term). He is Wendish on his paternal side; his grandmother was Emma Wukasch née Hannusch. He has written two books on Wendish language and history, and has written numerous reviews of scholarly books on Wendish and other Eastern European languages and cultures. He has given papers at scholarly conferences and has talked before church, senior, etc. groups. “Marja Grólmusec: The Rosa Luxemburg of the Sorbs” is a paper by Dr Charles Wukasch that was presented to the Slavic and East European Languages and Literatures Section of the South Central Modern Language Association Convention that was held in New Orleans, Louisiana on 29 October 2004. My interest in Grólmusec derives from several areas of interest: the Sorbs, multiculturalism (in this context, writers, political activists, etc. who are or were members of traditionally disadvantaged groups), and politics in general. I learned of and became interested in Grólmusec while researching my book A Rock against Alien Waves: A History of the Wends, which has just appeared. This being a Slavic section, I assume that all of us know at least something about the smallest of the Slavic peoples: the Sorbs (not to be confused with the Serbs) or Wends. (The preferred scholarly term is Sorbs, although some Sorbs have “reclaimed” the pejorative term Wends. The most common name for the Sorbs in Texas has always been Wends.) Still, let me comment on them briefly just in case some of you are not familiar with them. The Sorbs are members of the West Slavic subgroup, thus being related to the Czechs, Poles, and Slovaks. The Sorbs live in the southeastern corner of Germany. 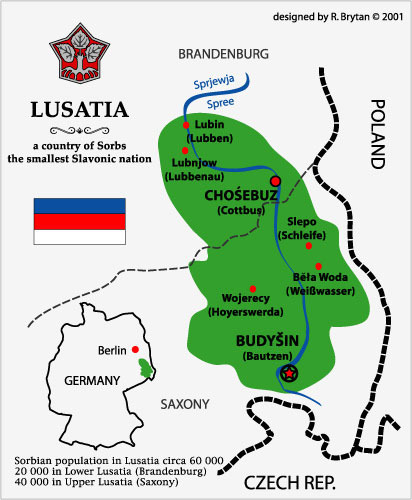 There are actually two Sorbian languages: Upper and Lower, Upper being the more widely spoken of the two. Whether the Sorbs comprise two ethnic groups can be debated. The tragedy of Dr. Marja Grólmusec (1896-1944 (G Maria Grollmuß)) is a moving and interesting one. Grólmusec (her middle names were Karolina Elisabeth) was born on April 24, 1896, in Leipzig, but spent her childhood vacations in Radwor (G Radibor), her father’s native village. (Radwor is a few miles northwest of Bautzen, the cultural center of the Upper Sorbs.) It was in Radwor that she got in touch with her Sorbian roots. Radwor was Grólmusec’s father’s native village; her mother, Carolina (neé Koelitz) was, however, an ethnic German from Karlsruhe. Two years later, on November 22, Grólmusec’s sister Cäcilia was born, also in Leipzig. She later taught school for one year in 1918 in Leipzig. In this same year, she joined the Sorbian Academy of Sciences Maćica Serbska, and a year later she helped found the Sorbian student group Wita. Between 1920 and 1925, she studied at the Universities of Leipzig and Berlin, with a major in history and minors in German and French. Grólmusec’s political activity began at this time. She joined the Verband Sozialistischer Studentengruppen (Union of Socialist Student Groups), serving as a delegate to their international conference (Fédération Internationale pour la Société des Nations) in Geneva in 1924. She also visited France and Czechoslovakia. In this same year, her father died; Eugenie Koelitz’s death occurred soon thereafter. In 1925, Grólmusec published a pamphlet titled “Die Frau und die junge Demokratie. Ein Versuch über Frau, Politik und Demokratie” (“Woman and the New Democracy: An Examination of Women, Politics, and Democracy”) This was followed in the following year by an article titled “Über die weibliche Form in der Politik” (“On the Feminine Form in Politics”; this article appeared in the journal Die Schildgenossen (The Comrade’s Shield ). She also got hired as a journalist for Die Deutsche Republik (The German Republic) in Frankfurt (am Main). In 1927 probably, Grólmusec joined the Sozialistische Partei Deutschlands (SPD). The years 1929 to 1933 were rough ones. She got another teaching job, this one in Berlin, but it was just for one semester. She experienced some unemployment; at other times, she was underemployed. During this troublesome period of time, there was at least some good news: In 1929, her dissertation was accepted; in the same year, she took her orals in history, German, and sociology and passed them. She was now Dr. Maria Grólmusec. In 1933, she moved to Radibor. One of Grólmusec’s areas of activity was attempting to forge an alliance between the Catholic left and the secular left. In other words, she anticipated what is today called liberation theology. She did not feel that there was any necessary conflict between the teachings of Marx and those of Christ. It was now that her political activity became – from the viewpoint of the authorities – of a criminal nature. She served as a courier, traveling between Germany and Czechoslavakia. Not surprisingly, she came to the attention of the Nazi regime. Grólmusec was arrested in 1934 by the Gestapo for her activities both as a secret courier to Czechoslovakia and as a campaigner for political prisoners in Nazi Germany. She was first incarcerated in the Dresden jail, but then received a six-year sentence and was transferred to the prison at Waldheim. In December 1936, the University of Leipzig revoked her doctorate. In the closing days of 1940, the German government tried to “turn” Grólmusec. They offered her both her freedom and medical care if she would aid the Nazi cause. She refused and in January 1941 was sent to the Ravensbrück women’s concentration camp., she worked with another Sorb, Marja Grofowa, to lessen the plight of Soviet and French prisoners-of-war. A fellow inmate referred to Grólmusec touchingly as “eine wahre Gabe des Himmels” (“a true gift from Heaven”). She suffered martyrdom in Ravensbrück in 1944. When you come home at five and ring our evening bells, you then sit down with your new sweets at the tea table, turn on the Christmas lights, and listen to a bit of music on the radio, which cheers up and comforts your heart. But will you find any? Yes, my little one – I know it – you think back to other Christmas Eves. It hasn’t been so long since you look so happily and with such amazement at the Christmas lights as that young girl, the Christchild, brought you a beautiful doll. It’s been a few years! But everything is now so dark and grave, and the doll is no longer sitting under the tree. And we know that the broken doll will never be fixed, and we’ll never be little girls again, and so, we’ll never laugh again the way we once did: easily and light-heartedly. Too much darkness has entered our lives, too much for us to be able to forget. But we don’t want to lose hope and courage. Was your lecture at Leipzig last year well attended? Were there questions from the audience? If so, do you remember any of the questions you were asked? I can’t recall if I made a head-count, but I imagine there were 25-30 people there, mainly students. I encouraged questions, comments, discussion, etc. from the audience, but don’t remember more than one or two examples. I do remember a student whose surname was Mitschke. Her sister is the editor of Rozhlad . I may have mentioned how in the Texas Wendish community some families (e.g., Miertschins, Mitschkes) kept up Wendish for years – good for them! Others (e.g., my great-uncle Paul Hannusch) had the attitude of “a good American speaks just English.” One of his sons (the Rev. Hugo Hannusch) told me once that his dad said “you boys are in America. I want you to learn just English.” Ich finde das schade! To je škoda! This article by Charles Wukasch first appeared on pages 1589-1590 in American Folklore: An Encyclopedia edited by Jan Harold Brunvand and published in 1996 by Garland Publishing, Inc., New York, NY. The Wends are the only group of Slavs who are primarily Protestant. In 1854, because of differences with the state church, a group of 500 conservative Wendish Lutherans under the leadership of Reverend Jan Kilian emigrated from Germany. Having disembarked in Galveston, they founded the farming community of Serbin (between Austin and Houston). The descendants of this immigration call themselves “Wends,” although the preferred academic term is “Sorbs.” The Texas Wendish Heritage Society in Serbin has attempted in recent years to increase an awareness among Texas Wends of their cultural and folkloric heritage. The society does this via folk festivals, guest speakers at society meetings, and a museum. Nielsen, George. 1961. Folklore of the German-Wends of Texas. In Singers and Storytellers, eds. Mody C. Boatright, Wilson M. Hudson, and Allen Maxwell. Publications of the Texas Folklore Society No. 30. pp. 244- 259. ________. 1989. In Search of a Home: Nineteenth Century Wendish Migration. College Station: Texas A & M University Press. Wukasch, Charles. 1987. “Dragons” and Other Supernatural Tales of the Texas Wends. Tennessee Folklore Society Bulletin 52:1-5. At the two summer Wendish courses I’ve attended (and health permitting, I hope to attend next summer’s, too), we visited Rev. Zejler’s church in Lohsa (Wendish: Łaz). It’s a sad example of how the Lutheran Wends in Lusatia aren’t keeping up their language like the Catholics are. At the first summer course I attended (2012), the church warden told me that they had discontinued Wendish services back in 1960. The water in the creeks, lakes, etc. of Germany is awfully cold by Texas standards. Rev. Zejler had warned an elderly member of his congregation who liked his daily morning swim that he was much too old for that sort of thing and was running the risk of pneumonia. As the Bible says (Matthew 4:7), we’re not to take risks with our health or safety. Well, his parishioner refused to heed his warning and continued to go for his swims anyway. The following article by Rachel Hildebrandt first appeared in Upper Sorbian in Rozhlad, 50 (2000) čo 6, pp. 216-218. It was translated into English by Dr. Gerald Stone. The place name Serbin is shown on only a few maps. It is a settlement founded in 1855 by Pastor Jan Kilian and around 500 Sorbian emigrants. Today it is the home of the Texas Wendish Heritage Museum, a center for the preservation of the culture of the immigrants. Since it was opened in 1980 it has been visited by thousands of people. The roots of the museum lie in the Wendish Culture Club. In 1970 a small group of elderly women held a meeting and founded it. They were united by their concern at the striking decline of the original Sorbian identity. The Wendish Culture Club, centered on its leader Lillie Mörbe Caldwell, aimed to react to that. The foundation of the club corresponded to a general American trend in the 1970s, known as “Back to Roots.” Two years later in August 1972 the women participated in the folk-art festival at the Institute for Texan Cultures, University of Texas. Here they were selling Wendish easter eggs and noodles. The club attracted attention again in 1975. The Institute for Texan Cultures asked for the loan of Wendish works of art and documents from Serbin for an exhibition of Texan folk-groups. This official recognition of Wendish history in the USA paved the way for the foundation of the museum five years later. Many Wendish records and documents were already lost. This intensified the developing discussion about the preservation of a log-cabin in Serbin threatened with ruin. The idea arose of a Wendish museum. The first official notice to that effect is dated 14 November 1978. A year later the Wendish Culture Club formally changed its name to the Texas Wendish Heritage Society. This society asked the leaders of St. Paul’s Church in Serbin to permit it to buy a plot of land which it was not using. The parish turned the proposal down, but agreed to a permanent tenancy for the symbolic rent of one dollar a year. The Serbin church made its old school available. The main building, built in 1915, was given the name St. Paul Building by those responsible for the museum. An extension built in 1929 was given the name Kilian Building. Here, after the opening of the museum on 8 November 1980, the society organized its first exhibition. The bigger St. Paul Building was at that time undergoing restoration. As a charitable, non-profit-making organization the society had hardly any money to buy exhibits. The museum was dependent on the gifts of Wendish descendants. These were amply provided in the form of such objects as furniture or work implements, books, archives and other written documents, but also memoirs provided orally. In 1982 the restoration of the St. Paul Building was completed and the exhibition was moved from the Kilian Building, which henceforth served for meetings, to the main building. Voluntary helpers managed everything, arranging a kitchen, a living room and nursery, and other rooms. There they interpreted in reality the former life of the emigrants, their everyday life. Like all American museums, which steadily expand, the Wendish Museum from its beginning had financial problems. Today it still has to live from private gifts. There is no support from the state or public funds. Firms like Coca-Cola and Exxon, for which some members of the Society work, and church affiliated organizations like Aid Association for Lutherans provided money, and more came from interested families and individuals. The largest grant came from the Peters Foundation. Louise Peter, the originator of this foundation, was the last still-living granddaughter of Pastor Jan Kilian and his wife Marija Gröschel. 130,000 dollars from the Peters Foundation made possible the construction of a new building for the museum, which serves as an exhibition room, library, and archive. With its shingles, window-shutters, and diagonal laths the building conforms to the Wendish building style of the nineteenth century. The building was ready and the question arose of a competent plan for exhibitions. In Nancy Teinert Allen we have an interested person of Wendish descent with experience in the museum business. She prepares all the exhibitions at present. Meanwhile, the museum owns – in addition to the complex mentioned – a further pair of log cabins on the same site. Like many other new things, the Kurio and Mertink cabins – named after the families that once lived here – come from donations. Private and institutional initiatives facilitated their renovation, because the two buildings, completed around 1860, were worn out by the beginning of the twentieth century. Nowadays little remains of such ‘immigrant architecture.’ So it was a lucky chance for the museum to acquire these objects. The furniture located in them attests to the poverty of most of the immigrants and their children. Městne mjeno Serbin je jenož na mało geografiskich kartach zapisane. 1855 je farar Jan Kilian z něhdźe 500 serbskimi wupućowarjemi wone sydlišćo załožił. Dźensa namaka so tam z ,,Texas Wendish Heritage Museum” k hajenju kultury imigrantow swojorazny stawizniski centrum. Wot jeho zahajenja w lěće 1980 su jón tysacy ludźi wopytali. Korjenje muzeja ležachu we ,,Wendish Culture Club” (Serbski kulturny klub). W awgusće 1970 zeńdźe so skupinka staršich žonow a jón załoźi. Wšěch jednoćeše starosć dla razantneho rozpada serbskeje praidentity. Serbski kulturny klub wokoło wjednicy Lillie Mörbe Caldwell chcyše na to reagować. Załoženje kluba wotpowědowaše tehdy tež powšitkownemu ameriskemu trendej w 70tych lětach – t. mj. ,,Back to Roots” (Wróćo ke korjenjam). Hižo dwě lěće pozdźižo, w awgusće 1972 wobdźělichu so žony na ludowuměłskim festiwalu Uniwersity Texas / Instituta za texaniske kultury w San Antonio. Tu předawachu serbske jutrowne jejka a nudle. Dalšu skedźbnosć zbudźi klub 1975. Institut za texaniske kultury prošešo wo wupožčenje serbskich wuměłskich twórbow a dokumentow ze Serbina za wustajeńcu wo texaniskich ludowych skupinach. Tute oficialne připóznaće serbskich stawiznow w USA runaše puc za załoženje muzeja pjeć lět pozdźišo. Wjele serbskich žórłow a časowych dokumentow bě so hižo zhubiło. Ćim intensiwnišo wuwiwaše so tohodla diskusija wo wuchowanju wot rozpada wohroženeje kładźiteje hěty w Serbinje. Nasta ideja wo serbskim muzeju. Prěnja protokolowa notica wo tym je ze 14. nowembra 1976. Lěto pozdźišo změni Serbski kulturny klub oficialnje swoje mjeno na ,,Texas Wendish Heritage Society” (Texasko-Serbske towarstwo namrěwcow”). Tute towarstwo prošeše nawodnistwo cyrkwje St. Paul w Serbinje, wot njeje njewužiwanu ležownosć za muzej kupić směć. Gmejna namjet wotpokaza, přihłosowaše pak trajnemu wotnajenju za symbolisku plaćiznu jednoho dollara lětnje. Serbinska cyrkej staji swoju staru šulu k dispoziciji. Hłowne twarjenje, hižo 1915 natwarjene, pomjenowachu zamołwići za muzej ,,St. Paul Building” (Paulusowe twarjenje). Přitwar z lěta 1929 dósta mjeno ,,Kilian Building” (Kilianowy dom). Tu zorganizowa towarstwo po zahajenju muzeja dnja 8. nowembra 1980 swoju prěnju wustajeńcu. Wjetše Paulusowe twarjenje w tym času hišće restawrowachu. Jako powšitkownje wužitna, na dobytk njewusměrjena organizacija njeměješe towarstwo lědma pjenjez za nakup eksponatow. Muzej bě na dary serbskich potomnikow pokazany. Tute so w formje předmjetow kaž meblow abo dźěłoweho grata, knihow, archiwalijow a dalšich pisomnych dokumentow, ale tež ertnje traděrowanych dopomnjenkow bohaće znosychu. 1982 bě wobnowjenje Paulusoweho twarjenja dokónčene a wustajeńca so z Kilianoweho domu, kiž wotnětka za zhromadźizny słužeše, do hłowneho twarjenja přeměsći. Dobrowólni pomocnicy wšo wobstarachu: zarjadowachu kuchnju, bydlensku a dźěćacu stwu a dalše rumnosće. Tam interpretowachu po woprawdźitosći něhdyše žiwjenje wupućowarjow, jich wšědny dźeń. Kaž kóždy ameriski muzej, kiž so pospochi rozšěrja, tłóčachu tež serbski muzej wot spočatka finančne starosće. Hišće dźensa dyrbi jeničce z priwatnych darow žiwy być. Pobrachuje statna kaž tež zjawna podpěra. Firmy kaž Coca-Cola a Exxon, za kotrež wšelacy čłonojo towarstwa dźěłaja, a cyrkwinske organizacije kaž ,,Aid Association for Lutherans” přewostajichu muzejej pjenjezy, dalše wot zajimowanych swójbow a jednotliwcow dochadźachu. Najwjetša přiražka pochadźa z Petersoweje załožby. Louise Peter, załožićelka tuteje załožby, běše poslednja hišće žiwa wnučka fararja Jana Kiliana a jeho mandźelskeje Marije Gröscheloweje. 130,000 dollarow Petersoweje załožby zmóžni natwar noweho twarjenja za muzej, kiž jako wustajenišćo, biblioteka a archiw słuži. Ze šindźelemi, wokeńcami a prěkušemi wotpowěduje dom serbskemu twarskemu stilej 19. lětstotka. Twarjenje běše hotowe a nasta prašenje za kmanym naćiskom za wustajeńcy. W Nancy Teinert Allen namaka so zajimowana wosoba serbskeho pochada z nazhonjenjemi we wobłuku muzejownistwa. Wona wšě aktualne wustajeńcy přihotuje. Mjeztym wobsedźi muzej – dodatnje k spomnjenemu kompleksej – dalšej kładźitej domaj na samsnej ležownosći. Kaž mnohe druhe nowosće pochadźatej tež Kurjowa a Mertinkowa hěta – pomjenowanej po něhdy tu bydlacymaj swójbomaj – z darow. Priwatne a institucionelne iniciatiwy zmóžnichu jeju wobnowjenje, dokelž běštej wokoło 1860 natwarjenej domaj spočatk 20. lětstotka dodźeržanej. Dźensa namaka so jenož hišće mało tajkeje ,,wupućowarskeje architektury”. Tuž je zbožowny připad za muzej, zo tutej objektaj dósta. Tam zaměstnjene meble swědča wo chudobje wjetšiny imigrantow a jich dźěći. The following article by Dr. Charles Wukasch first appeared in Rozhlad, 50 (2000) čo 6, pp. 218-219. Hdyž wupućowachu Serbja w lěće 1854 pod nawodom fararja Jana Kiliana z Łužicy do Texasa, přinjesechu tež swoju serbsku folkloru do noweho swěta sobu, a cyle přirodnje so w skupinach imigrantow w Texasu pod wliwom kultury noweje domizny tež nowa serbska folklora wuwiwaše. Kaž to powšitkownje bywa, hraje tradicionalna folklora dźensa mjeńšu rólu. Tak pisach 1988 w nastawku wo serbskej folklorje w Texasu: ,,In an increasingly modernized culture with television taking the place of storytelling sessions organized by parents and grandparents, traditional folklore is bound to vanish.” Z druhimi słowami, tradicionalna folklora steji dźensa w konkurencnym boju z modernej kulturu. Kózdy ludowědnik znaje prašenje: Što je folklora? Doskónćna definicija słowa folklora pak njeje zaměr mojeho přinoška. Wěsće směm wočakować, zo čitar znajmjeńša powšitkownu a praktisku definiciju znaje. W konteksće přinoška woznamjenja zapřijeće folklora wěru, ludowe legendy atd. wo nadpřirodnych zjawach, w serbskim konteksće wěra do wódneho muža, připołdnicy, zmija atd. Folklora móže často praktiski zaměr měć. K tomu je wěra do wódneho muža dobry přikład. W texaskej serbskej folklorje baje wo nim njeznaju, ale starši swoje dźěći před wódnym mužom warnowachu, wón hraješe didaktisku rólu: Dźěći njesmědźachu bjez dowolnosće abo přewoda staršich so w rěkach, hatach atd. kupać. Haćrunjež žanoho wódneho muža njeběše, eksistowaše woprawdźity strach zatepjenja. Dźěći sej snano předstajić njemóžachu, što rěka so zatepić, ale móžachu sej wěsće předstajić, zo bydleše we wodźe potwora. Mała holčka sej před rowom na kěrchowje při Pawlowej cyrkwi pola Serbina hrajka. Holčka tyknje ruku přez mały płót a praji: ,,Popadń mje, popadń mje!” Naraz wusunje so z rowa ruka a holčku dźerži. Wona zakřiknje a wótře płaka, farar Kilian to słyši a chwatnje přiběži. Potom so k Bohu modli, doniž so ruka njezhubi. Cyłe žiwjenje pak ma holčka čerwjeny wotćišć ruki na swojej ruce, hdźež běše ju ćěło přimnylo. Tež tu hraje folklora powučacu rólu: Dźěći, budźće dušne a ćiche na kěrchowje, tam njeje žane hrajkanišćo! Hač woprawdźe do zmijow wěrjachu abo njewěrjachu, tuta baja hraje na kóždy pad powučacu rólu: Njewužiwajće okultiske mocy! Motiw ,,Sedma kniha Mójzesa” je na baje wo zmijach podobny, tež wón hraje didaktisku rólu: Je zakazane, so čertowskich mocow posłužować. W jednej baji namakaja někotři wučomnicy, hdyž je jich mišter z domu, spodźiwnu knihu. Woni započnu knihu čitać, a wróny do jstwy přilětaja. Mišter so nawróći a widźi, što je so stało. Tež wón počina w knize čitać, ale wotzady, wot poslednjeje strony. Wróny z domu wuleća. Na tutej baji spóznajemy druhi didaktiski wutk: Dźěłaćerjo (w tym padźe wučomnicy) maja pilnje dźěłać a nic lěnikować. Bychu-li wučomnicy w dźěle pokročowali, so wěc z wrónami stała njeby. Z tutych přikładow wuchadźa, zo hraješe folklora w serbskej koloniji w Texasu praktisku rólu. Folklora njeje jenož radosć, wona tež wašnja kultury a awtoritu staršich podpěruje. Nielsen, George R.: In Search of a Home: Nineteenth-Century Wendish Immigration. College Station: Texas A&M UP, 1989. Wukasch, Charles: ,,Dragons and Other Supernatural Tales of the Texas Wends.” Tennessee Folklore Society Bulletin 52 (1987): 1-5. Jara zajimawe! Sehr interessant! Very interesting! I was once asked if I had any documentation for the quote in my book that Luther had supervised the burning of witches in Wittenberg. (Remember, I was citing the work of another scholar.) An old Concordia friend sent me the link below. Of course, after 500 years it’s hard to know the exact truth, but it seems that the truth may lie somewhere in-between. So, maybe although Luther didn’t actually light the fire himself, one might argue that his approval of the same was tantamount to actually carrying out the act. It reminds me of Henry II’s famous (infamous?) remark “Will no one rid me of this troublesome priest?” Several of his knights took him literally and murdered Thomas á Becket in Canterbury Cathedral in 1170. The following article first appeared in the Sächsische Zeitung on Tuesday, 19 July 2016. The original German follows the English translation done by Weldon Mersiovsky and Charles Wukasch. Sorbian learners from all over the world visited Lohsa and experienced a premiere. Pastor and poet Handrij Zejler (1804 – 1872) would be certainly pleased. His Sorbian folk song ‘Hanka budź wjesoła,’ Hanka be cheerful, was heard on Sunday for the first time accompanied by Ruth Hall on the organ in the Lohsa Church. And for a special occasion 17 participants of the two-week international vacation course “Upper Sorbian” – organized by the Sorbian Institute Bautzen – sang it together with members of the Association meeting place Zejler Smoler Haus Lohsa. Lohsa was the last stop of their tour on Sunday. We went to Malschwitz in the morning to learn “Lubka lilija,” Handrij Zejler’s folk song Dearest Lily. Its history was explained by Franz Schön, long-time employee of the Sorbian Institute. In Schleife the participants visited the Sorbian culture centre. In Rohne, they gained insights into the Njepila-Hof. In Lohsa, they visited the Zejler Smoler House, the church, the Handrij Zejler monument and the tomb of Handrij Zejler. The group was welcomed with bread and salt. Andreas Miersch with French horn, Monika Aust and Rosemarie Kloß in the Sorbian apparel of Lohsa welcomed the visitors with Sorbian folk songs. “This year it is the 20th course. We have adopted the model after the founding of the Sorbian Institute of the Institute of Sorabistik of the University of Leipzig,” explained Dr. Susanne Hose, researcher of the Institute. Together with Dr. Fabian Kaulfurst, she manages the holiday course. Language learning is at the heart; in addition knowledge of the Lusatian culture. The participants have much to learn about the lifestyle and culture of the Sorbs in upper and lower Lusatia. Especially the meetings enrich the students. Here, they meet again Sorbian speakers. “We try in the course to speak Sorbian together,” said Magdalena Vigent. The 44-year old native Pragerin speaks German, Russian, Portuguese, French and English besides her native Czech. She currently lives with her family in Paris. There, she teaches at the INALCO University of Czech for foreigners. She perceives Sorbian as personal enrichment. Sorbian, she learns through her love of languages. In the 1970s she visited the Spreewald with parents. In the current holiday course, she enjoys especially singing. In addition, they inspire the encounters. “I want to know also how the language is preserved,” she reiterated on Sunday in Lohsa. Sorbischlernende aus aller Welt besuchten Lohsa-und erlebten eine Premiere. Pfarrer und Dichter Handrij Zejler (1804-1872) wäre sicher erfreut gewesen. Sein sorbisches Volkslied “Hanka budź wjesoła” (Hanka sei fröhlich) erklang am Sonntag erstmals mit der Orgel durch Charlott Hörenz begleitet in der Lohsaer Kirche. Und das zu einem besonderen Anlass. 17 Teilnehmer des zweiwöchigen Internationalen Ferienkurses “Obersorbisch”- organisiert vom Sorbischen Institut Bautzen – sangen es mit Mitgliedern des Fördervereins Begegnungsstätte Zejler-Smoler­Haus Lohsa zusammen. Lohsa war die letzte Station ihrer Exkursion am Sonntag. In Malschwitz ging es zuvor am Morgen um Handrij Zejlers Volkslied “Lubka lilija” (Liebste Lilie). Dessen Geschichte erläuterte Franz Schön, langjähriger Mitarbeiter des Sorbischen Instituts. In Schleife besichtigten die Teilnehmer das Sorbische Kultur­ zentrum. In Rohne gewannen sie Einblicke in den Njepila-Hof. In Lohsa besuchten sie das Zejler-Smoler-Haus, die Kirche sowie das Handrij-Zejler-Denkmal und das Handrij-Zejler-Grab. Mit Brot und Salz hieß sie der Förderverein willkommen. Andreas Miersch mit Waldhorn sowie Monika Aust und Rosemarie Kloß in Lohsaer sorbischer Tracht erfreuten die Besucher mit sorbischen Volksliedern. “Dieses Jahr ist es der 20. Kurs. Wir haben das Modell nach Gründung des Sorbischen Instituts vom Institut für Sorabistik der Universität Leipzig übernommen,” erläuterte Dr. Susanne Hose, wissenschaftliche Mitarbeiterin des Instituts. Zusammen mit Dr. Fabian Kaulfürst leitet sie den Ferienkurs. Im Mittelpunkt steht der Spracherwerb. Hinzu kommt lausitzkundliches Wissen. Viel sollen die Teilnehmer über Lebensweise und Kultur der Sorben in der Ober- und Niederlausitz erfahren. Vor allem die Begegnungen bereichern die Kursteilnehmer. Hier treffen sie immer wieder sorbische Muttersprachler. “Wir versuchen, im Kurs selbst viel miteinander sorbisch zu reden,” meinte Magdalena Vigent. Die 44-jährige gebürtige Pragerin spricht außer ihrer Muttersprache Tschechisch noch Deutsch, Russisch, Portugiesisch, Französisch und Englisch. Heute lebt sie mit ihrer Familie in Paris. Dort lehrt sie an der Inalco-Universität Tschechisch für Ausländer. Sorbisch empfindet sie als persönliche Bereicherung. Sorbisch lernt sie durch ihre Liebe zu Sprachen. Bereits in den 1970er-Jahren besuchte sie mit den Eltern den Spreewald. Im jetzigen Ferienkurs erfreut sie vor allem das Singen. Zudem begeistern sie die Begegnungen. “Ich will auch erfahren, wie die Sprache bewahrt wird,” bekräftigte sie am Sonntag in Lohsa. Diese Frage bewegt genauso Charles Wukasch (75) aus Austin in Texas (USA). Dort lehrte er früher als Professor an der University of Texas Slawistische Linguistik. “Meine Hauptfächer waren slawische Sprachen wie Russisch, Tschechisch, Serbokroatisch und Kirchenslawisch,” schilderte er. Seine Urgroßeltern väterlicherseits gehörten 1854 mit pfarrer Jan Kilian (1811-1884) zu den sorbischen Auswanderern aus der Lausitz ins texanische Serbin. Mit ihrer Geschichte und ihren Nachfahren fühlt sich Charles Wukasch tief verbunden. 1965 besuchte er seinen ersten Sorbisch-Kurs an der Universität Leipzig. Seitdem lernt er die Sprache weiter. “Ich bin sorbischer Patriot. Bedingt durch meine Vorfahren,” sagte er. “Minderheitensprachen interessieren mich seit Langem. Ich will, dass sie lebendig erhalten bleiben.” Jede erworbene Sprache, so betonte er, bereichert uns. Jede Sprache bereichert das Mensch-Sein. Report on Charles Wukasch’s trip to Leipzig and Bautzen while living in Poland for about a year. I spent three days in Leipzig and three in Bautzen, my two favorite cities in the “old country.” In Leipzig, in addition to getting together with friends (both German and Wendish), I visited the Wendish (Sorbian) Dept. at the university. I’ll give a lecture there in May. I’ll speak in English, although I may say a few words in my bad German and Wendish. My talk will be on minority language and cultural maintenance, with special reference to the Texas Wends. At the Wendish bookstore in Bautzen, I bought a new book (expensive and heavy) titled Sorbisches Kulturlexicon, an encyclopedia on the Wends. I joked to Annette that there was nothing in it on the TWHS, but maybe there will be an entry in the second edition. Yesterday (Sunday) a.m. I visited St. Peter’s in Bautzen (as you all know, the landmark church there – in German Der Dom St. Petri and in Wendish Katedrala swj. Pětra ) and caught the tail end of a Catholic service. I read on the Lutheran announcement board outside that at 9:30 a.m. there would be a service at the Mary and Martha Lutheran Church (in German Die Maria-und-Martha-Kirche and in Wendish Cyrkej Marje a Marty). I asked someone who had left the Catholic service where that was, and in the spirit of ecumenalism, he said “hop in and I’ll drive you there.” I attended the Lutheran service. I had never been in that church. Although not as famous as St. Peter’s, it’s nonetheless a lovely church. If you want to see a photo of it, check out: https://de.wikipedia.org/wiki/Maria-und-Martha-Kirche_(Bautzen). Sadly, it’s rare that Wendish is used in the churches in Bautzen. I’ve heard that Pastor Mahling preaches once a month in Wendish. However, if one wants to find churches which preach weekly in Wendish, one must go to the Catholic villages. Re: This the 500th anniversary of the Reformation, I’m not a theologian (Dave Goeke can help us out there), but we often forget that Luther didn’t want to start a new church, but rather to reform the church. In the same way, Henry VIII didn’t want to start a new church, but when he broke with Rome about the same time Luther did, he felt he was reforming the church. Of course, Henry VIII and Luther didn’t agree on everything. Henry wrote his famous Defence of the Seven Sacraments (in Latin Assertio Septem Sacramentorum). Speaking of books, when I was in Bautzen in 2016 for the Wendish summer course, I bought an interesting book titled Luther und Calvin: Briefe, die Nie Geschrieben Wurden. These were hypothetical letters between Luther and Calvin on various theological matters. It reminded me of C. S. Lewis’s book Letters to Malcolm: Chiefly on Prayer. These books use the literary technique of the epistolary novel (a book written in the form of letters between two people). A few individual comments: Sandra [Matthijetz], I noticed that the Bresan Bakery which we’ve discussed was closed for a week due to the illness of the owner (or maybe manager). Richard [Gruetzner], as I said, I haven’t joined the smartphone or tablet generation, so I couldn’t photograph the family property you asked me to. But when Jim comes on his visit, I’ll have him do it. Your family property is a good news – bad news situation. The good news is that you and Cathleen have inherited it. The bad news is that you owe about a million dollars (actually euros) in back taxes, and the German government has gotten an international lawyer to put a lien on your home in Texas. OK, enough silliness! But seriously, I’ll have Jim take some photos. When he comes to visit later for his first trip to Lusatia, we hope to see Cottbus in addition to Bautzen. I’ve only been to Cottbus in transit. As you know, Cottbus is the cultural center of the Lower Sorbs (Wends). If the weather is nice, maybe we can do a cołnowanje (boat trip on the Spree). Finally, I got together with Susana Hose one day at the Cafe Marx (my favorite Konditorei in Bautzen) for a nice chat. I hope she’ll be able to visit us in Texas again sometime. Language death occurs usually as a combination of circumstances. In the Lower Sorbian area the cohesion of the language area with its dialectal features was considerably reduced by moving entirevillage populations to other areas in order to get easily to the lignite coal deposits. This in itself required more effort to speak the language across generations. The revivalists in Cottbus thought they could prevent language death by increasing usage but as Harrison put it so well: when it came to getting together and speak Lower Sorbian as it had been spoken 50-60 years ago, nobody showed up. This, as most revivalists will agree with now, is an impossible task (purism never pays off in such efforts). Then, the mere effort to get people together to speak Lower Sorbian in a natural environment – after a few trials people never showed up – there was simply no motivation. Here one can learn a great deal from the revitalization of indigenous languages where goals are set much lower, i-phones are used without having to be in a class-room situation, and purism (overcorrection) is a no-no. But you tell that to the Sorbs: “Gunter, we aren’t any Indians!” Of course, Lewaszkiewicz is right also – the Sorbs were too enthralled by consumerism rather than making time to maintain and revitalize their language.